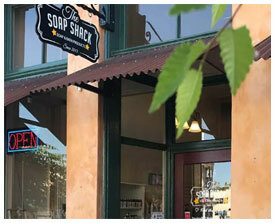 The Soap Shack is a family owned and operated business started in early 2013 by Tiffany and James Meek. At The Soap Shack. We believe in using ingredients with a purpose, we research every ingredient we use in our products to ensure it has a reason to be included as well as ensure it meets our high standards. Our products are NEVER tested on animals, NO Phthalates, NO Parabens, NO Sulfates, NO Triclosan. The most important ingredient of all however is the love we put into every product we make. We truly believe that the love we have and enjoyment of making the best products possible transfers into our products. So we like to say try our soaps and our bath products and Feel the Love.